World of Pinot Noir Burgundy Presentation Don Kinnan’s slide presentation from “Terroir: The Soul of the Côte d’Or” held on Saturday, March 2, 2013, is now available for viewing on the World of Pinot Noir website at www.wopn.com. The audio recording of Kinnan’s seminar is also available on both the World of Pinot Noir website and Grape Radio at www.graperadio.com. World of Pinot Noir email subscribers receive a 10% discount on the French Wine Society’s new Bourgogne Master Level Program. 16th Annual Anderson Valley Pinot Noir Festival Technical Conference The schedule of the full day Technical program on May 17n has been announced. Visit www.avwines.com for information on the entire event which will be held May 17-19, 2013. Greg Walter of Pinot Report will discuss the current state of Pinot Noir; Glenn McGourty, a viticulture and plant science advisor will give a report on the state of viticulture in Mendocino County and agricultural water use in Anderson Valley; a comparative tasting of Pinot Noir Blanc from New Zealand, Oregon and Anderson Valley will be offered; I will present a talk on Pinot Noir Suitcase Clone “828”; Mel Knox, broker for Tonnellerie Francois Frères and Tonnellerie Taransaud, will speak on barrel selection for Pinot Noir; a Riedel glass comparative tasting panel will follow; and a focus tasting panel with Brad Wiley will present wines of Wiley Vineyards. The Technical conference will include a lunch in the Fairground’s Redwood Grove including buffalo burgers and a selection of local wines. 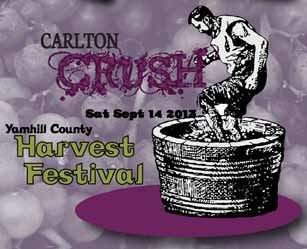 2013 Carlton Crush Festival Registration is now open for the Carlton Crush competitions at the 2013 Carlton Crush Harvest Festival. The event will be held on September 14, 2013, to celebrate the unique culture of Carlton and Yamhill County. Live music and entertainment, food and wine, an Artist’s market, and helicopter rides. Registration forms for the Grape Stomp, Barrel Rolling Race and Wine Thief Relay are available on the event’s website at www.CarltonCrush.com. 9th Annual Marin Wine Celebration An opportunity to taste newly released Marin-grown wines including some library selections, poured by vintners and growers at the historic Escalle Winery in Larkspur. These small lot wines are truly hand made and reflect the unique bounty of Marin County agriculture. Participating wineries include Bailiwick Wines, Burning Bench Cellars, Couloir Wines, DeLoach Vineyards, Dept C Wines, Dutton-Goldfield Winery, Easkoot Cellars, Kendric Vineyards, McEvoy Ranch, Pacheco Ranch Winery, Pey-Marin Vineyards, Point Reyes Vineyards, Sean Thackrey, Skywalker, and West Wind Wines. Saturday, May 11, 2013, from 3:00 to 7:00. Cost is $55. Visit www.malt.org. Proposed Sta. Rita Hills AVA Expansion A petition to extend the eastern boundaries of the Sta. Rita Hills AVA has recently been submitted to the TTB by Patrick Shabram. The Sta. Rita Hills AVA lies within the larger Santa Ynez Valley AVA, an east-west transverse valley with a continuum of climatic and geological features influenced by its opening to the Pacific Ocean. It spans over 31,000 acres at the far western end of the Santa Ynez Valley and has one of the longest growing seasons and coolest climates among winegrowing regions of California. The current and original AVA boundaries were carefully determined in 2001 by the original petitioners based on patterns of daily oceanic fog and temperature data. The eastern boundary to the AVA is a north-south range of hills that alters the sea fog pattern and brings an increase in daily temperatures moving east from this boundary. In the opinion of the original petitioners and the Sta. Rita Hills Winegrowers Alliance (SRHWA), it is imperative that the cool climate environment for winegrowing is maintained. A study of the data in the petition submitted by Mr. Shabram will be reviewed by the SRHWA board, but at this time the SRHWA stands by the integrity of the original and current boundaries. Visit www.staritahills.com. Sta. Rita Hills Wineries on the Road SRHWA members will be sharing their new vintages at three locations throughout California: April 29 at The Wine House in Los Angeles, May 13 at The Firehouse Fort Mason Center, and May 14 at Stark’s Steak House in Santa Rosa. The evening tastings are open to the public. Participating wineries include Cargasacchi, Cold Heaven, Clos Pepe, D’Alfonso Curran, Dragonette, Fiddlehead Cellars, Flying Goat Cellars, Hilliard Bruce, Huber, Kessler-Haak, Lindley, Liquid Farm, Longoria, Pali Wine Company, Rozak, Siduri, The Hitching Post, Transcendence, and Zotovich Cellars. Visit www.staritahills.com. 2013 Pigs & Pinot Recap On March 22-23, Chef Charlie Palmer’s Eight Annual Pigs & Pinot Weekend was held at Hotel Healdsburg and Dry Creek Kitchen. Honored guest chefs were Jose Garces, Dean Fearing, Elizabeth Falkner, and Craig Stoll and top Pinot Noir winemakers lent their talents to raise funds for Share Our Strength and local Sonoma County charities and organizations. The Pinot Cup Winner was the 2010 Roth Estate Sonoma Coast Pinot Noir and the runner up was the 2011 Te Kairanga John Martin Reserve Martinborough New Zealand Pinot Noir. The Sommelier Smackdown Winner was the 2011 Lucia Soberanes Vineyard Santa Lucia Highlands Pinot Noir and the runner up was the 2010 Bergström Homage Willamette Valley Pinot Noir. The Gala Dinner at Dry Creek Kitchen featured a signature creation from Palmer and the visiting master chefs, paired with Pinot Noirs from De Loach Vineyard, Domaine A.F. Gros, Kosta Browne, Martinelli Winery and Sea Smoke. Hotel Healdsburg’s sister property h2 Hotel offered a Swine and Wine dinner the same night featuring some of the Bay Area’s most innovative chefs and the Pinot Noirs of Cobb Wines and VML Winery. Join the mailing list to try to get a coveted ticket to next year’s Pigs & Pinot event: www.hotelhealdsburg/pigsandpinot/. Prodigal Ceases Production Steve and Mary Russell have announced that after wrestling with a tough decision for the last two years, they decided to produce no more wine. They will be concentrating instead on their Quinta Santa Rosa Vineyard and their bucket list. Their excellent wines are on sale at half price at the tasting room in shared space with Standing Sun Wines, 92 Second St., Unit D, Buellton, CA. Pinot Leaf Curl and Pinot Leaf Roll Take Their Toll Pinot leaf curl has been seen more often in Sonoma County’s Pinot Noir vineyards during the cool vintages of 2010 and 2011. Researchers have theorized that it is due to a nitrogen disorder that leads vines to produce the toxic compound putrescine and seems to be related to vineyard location and low spring temperatures. Another condition, leaf roll, is due to a virus. Sadly, it has taken its toil on the Old Vineyard at Hirsch Vineyards in Cazadero, on the far reaches of the Sonoma Coast. 2011 was the last year for most of the Old Vineyard as yields had declined significantly. 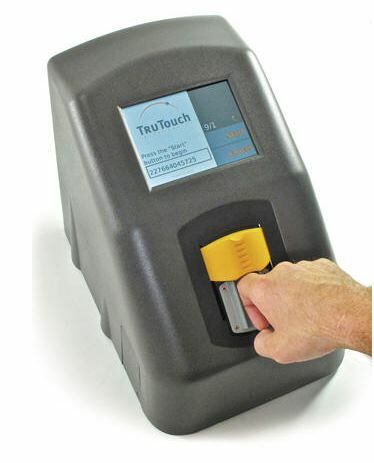 Fingertip Alcohol Scanner As reported in The Drinks Business (April 9, 2013), the AlcoSense TruTouch 2500 was launched at the Commercial Vehicle show in Birmingham, England. The new technology can determine a person’s level of intoxication in seconds with just a touch of a finger and is 96% accurate. The scanner uses a near-infrared light to measure blood alcohol content in the skin through contact with an optical pad. The system can also be used to determine the identity of the user. The TruTouch is not yet certified in the UK. Visit www.AlcoDigital.co.uk. 2012 Record Wine Sales in United States According to The Financial ( www.finchannel.com, April 8, 2013), wines sales in the U.S. from all U.S. states and foreign countries increased 2% from the previous year to a new record of 360.1 million 9-liter cases with an estimated retail value of $34.6 billion. California wine accounted for 58% of the sales. California wine shipments to all markets in the U.S. and abroad reached 250.2 million cases. It is predicted that wine consumption in the U.S. will continue to increase over the next decade. Chardonnay is still the most popular varietal (21% share of volume), followed by Cabernet Sauvignon, Merlot and Pinot Gris in that order. Direct-to-Consumer Wine Shipments The 2013 Wines & Vines and Ship Compliant Direct Shipping Report found that the value of direct-to-consumer shipments from American wineries increased to $1.46 billion in 2012, and was greater than the total value of U.S. wine exports. The 10% increase in sales of direct-shipped wines continues the sales channel’s history of outpacing the growth of overall wine sales in the U.S.. More than 2.17 million 9-liter cases of wine were shipped direct to American consumers in 2012, a 7.7% increase over the year before. The 2013 Direct Shipping report is available free for downloading by visiting www.shipcompliant.com/shippingreport. Non-Sulfured Wines May Become Available According to The Drinks Business (April 16, 2013), a company in Italy, Integrapes, is testing an antioxidant and antibacterial preservative derived from grape pips that it believes is as effective as sulfur. In addition, the wine is said to retain more of wine’s natural aromas, particularly the delicate floral aromas that sulfur can obscure. The compound is derived from the polyphenols found in grape seeds and the resulting solution is then added to the must and wine at various stages of the winemaking process. Essentially, one liter of the preservative is added to every 20 hectoliters of wine at the end of alcoholic and then malolactic fermentation and then before bottling. The resulting wine supposedly has the potential to age, unlike non-sulfured “natural” wines (the company producing the preservative has followed wines for seven years). The product has been endorsed by Italy’s leading wine writer, Luca Maroni, who is collaborating in the testing. Why Indicate pH & TA in PinotFile Wine Reviews? You won’t see these figures in reviews from any other wine publication, but I believe this is just as relevant as the alcohol percentage or barrel aging regimen. It gives the consumer some valuable additional information that can be used as an adjunct to making choices about which wines to drink. Thanks to Dan Goldfield’s Dutton Goldfield Newsletter and Gary Farrell in his Alysian Wines Newsletter for the following explanations. Acidity is a measure of the breakdown of products of water in solution. In other words, a small amount of water is broken down to H+ (hydrogen without its electron, which is negatively charged, hence the positive charge here) and OH- (the oxygen keeps the extra electron, thus the negative charge). H+ is the active agent of acidity so the higher the H+ concentration, the more acidic the solution. pH is a measure of the strength of acidity. Since pH is the negative log of the H+ concentration, the lower the pH, the more acidic the solution. Pure water has a pH of 7. Blood is 7.2 and bleach is 9. On the other end, coffee is about 5, lime juice is 2 and stomach acid is between 1 and 2. Wine tends to fall between 3 and 4, but from pH 3 to pH 4 there is a tenfold reduction in H+ so this variation is significant. pH is a critical measurement during winemaking and ideally should be below 3.60 for sulfur dioxide to be effective during the winemaking process. Lower pH juice ferments cleaner and produces more favorable flavor. A higher pH will increase the chance of Brettanomyces and the growth of spoilage organisms. The average red wine in California with a finished pH of 3.6 requires 50% more free sulfur than a finished red wine at pH 3.4 to offer equal protection. Lower pH is associated with an intensified red wine color, lower pH wines tend to age more slowly, and the brightness and tart balance of a wine comes from its acidity. Acidity also affects the way a wine shows oak aging. Higher acid wine tends to show wood more slowly and changes the choices a winemaker might make in that regard. Low acid (high pH) wines can be flat and lack freshness. Wines with generous acidity are more likely to be crisp, vibrant and refreshing. The other common way of expressing acidity is the titratable acidity or TA. This test measures the total of all acids present. The perception of acidity in a wine is related to the TA and not pH. TA produces the acid sensation in the mouth and is most critical for mouth feel. pH and TA values do not run parallel, and a wine can have a high pH and a low TA or vice versa. However, wines with higher total acidity generally exhibit lower pH values. Higher TA tends to make the astringency of a wine more apparent, as does higher alcohol. The balance of TA with alcohol, which is perceived as sweet, is very important to the flavor profile of a wine. 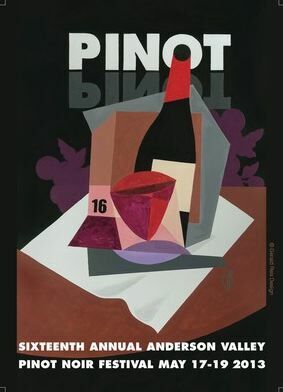 Pinots in the Marketplace How much highly desirable California Pinot Noir is bought to sell rather than bought to drink? Every day, I receive offers from resellers to buy Pinot Noir on the secondary market, often with a significant markup over the original release retail price. There is a remarkable amount of Pinot Noir for sell produced by prominent, highly regarded wineries, and I wonder how much of this wine is being drunk? I see more resell offers for Williams Selyem Pinot Noir than any other California Pinot Noir producer, but Kosta Browne, J. Rochioli, Rivers-Marie, Rhys and Marcassin are frequently resold as well. Much of this resell activity stems from the fact that all these producers highly allocate their wines to mailing lists that are full, so their is a segment of wine enthusiasts for whom their only access to these wines is to buy them on the secondary market. The result is that some buyers on the mailing lists buy to sell, and many on the outside buy at a premium to drink. U.S. Dept of Health and Human Services Most Recent Data (2008) Oregon is #15 among U.S. states in per capita consumption at 4.3 gallons, California is #9 at 4.9 gallons, and District of Colombia is #1 at 8.8 gallons. Apparently our politicians love wine. Second Annual Passport to Pinot Russian River Valley Winegrowers (RRVW) has announced its Second Annual Passport to Pinot Barrel Tasting Weekend on June 8-9, 2013, from 11:00 to 4:00. More than 30 wineries will share exclusive offerings with ticket holders including barrel tastings, futures purchases, library tastings, food pairings, artist demonstrations and entertainment. Tickets are $65 for the weekend that includes both days. A limited number of Sunday only and Designated Driver tickets are available. For information and to purchase tickets, visit www.rrvw.org or call 877-650-3717. The documentary, "From Obscurity to Excellence: The Story of Grapes & Wine in the Russian River Valley" will be shown on June 7 at the Vintner's Inn in Santa Rosa following a wine reception. See a preview of the film at www.russian-river-valley.com. Tickets may be purchased online at www.rrvw.org/passport-to-pinot. Memorial Weekend in Oregon Wine Country The traditional Memorial Weekend in the Wine Country will be held in the Willamette Valley May 25-27, 2013. Many Oregon wineries that are not open to the public will be hosting open houses this weekend. Hosted by the Willamette Valley Winegrowers Association, a guide is available at www.willamettewines.com or use the Mobile Wine Tour app that is compatible with all smart phones at www.WillametteWineMap.com.